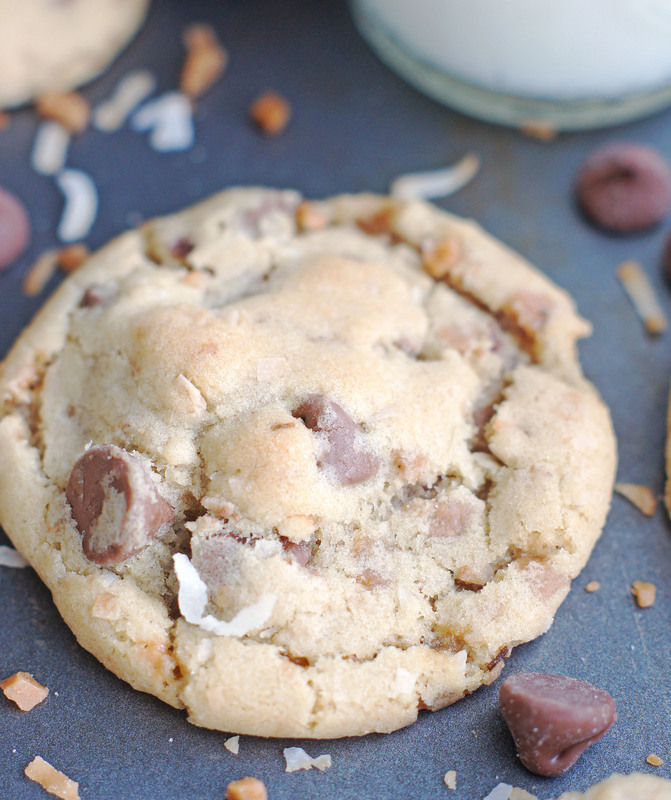 Toasted Coconut Toffee Chocolate Chip Cookies are packed with so much yumminess. Golden crisp edges and chewy in the middle. My kind of cookie! In case you haven’t met me, I am a cookie/cookie dough junkie. The number of cookie recipes I have on my site ought to be a dead give away. I probably make cookies 5 times a week. I just can’t seem to get enough cookies or dough. I know, I have issues. If I had to guess, I’m pretty sure my friends and neighbors love the fact that I have a cookie addiction. There are no complaints there, that’s for sure. These Toasted Coconut Toffee Chocolate Chip Cookies are my latest concoction and I’m pretty much in love with them. I mean how could I not be? 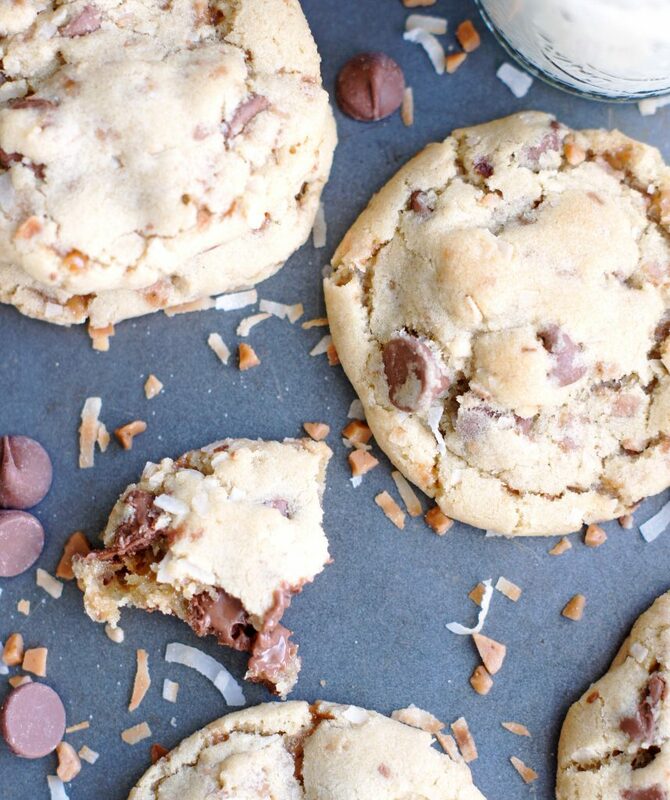 They’re loaded with toasted coconut, milk chocolate chips and crunchy toffee bits. What’s not to love? 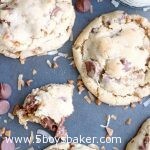 These cookies are buttery, have crispy edges and the toasted coconut and toffee bits create a chewiness that is so, so good. Oh, and the dough! The dough is so ridiculously delicious! I ate way more than I should have, but I just couldn’t help it. . . really, I couldn’t! This cookie dough is fairly thick and stiff and doesn’t the cookies tend to stay a little puffier after baking, so if you like a flatter cookie, then just gently press down on the cookie dough balls before putting them in the oven. 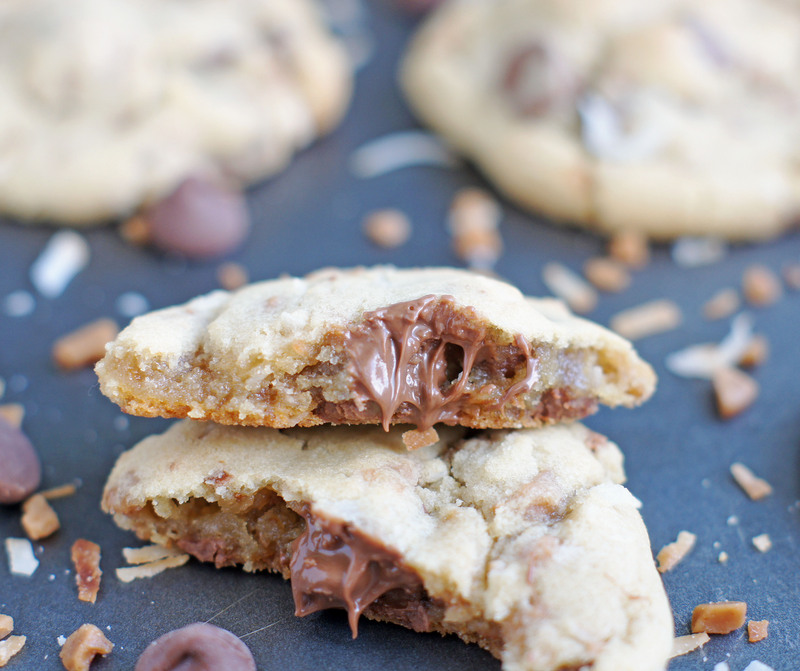 Now do yourself a favor and go make these cookies. I promise you will love them! Preheat oven to 350 degrees. Line a cookie sheet with a silpat liner or parchment paper. In a large mixing bowl, cream butter and sugars together. Add egg, egg yolk, vanilla, and coconut extract, mix until well combined. Add flour, baking soda, and salt and mix until it is just incorporated. Add chocolate chips, coconut and toffee bits, stir until blended. (The cookie dough will be thick and fairly stiff). .
Scoop dough (about 2 tbsp) onto cookie sheets, about 2" apart. Bake for about 12 minutes or until cookies edges are barely golden brown. Let rest on cookie sheet for about 3 minutes before moving to a wire rack to cool. My favorite way to toast coconut is to put it in a large skillet and cook it on the stovetop over medium-low heat, stirring frequently, cook it until it's golden brown (about 4-5 minutes). Another way is to heat the oven to 350°F and spread coconut evenly on a cookie sheet. Bake for 7 to 8 minutes or until light golden brown, stirring occasionally. I am a cookie junkie as well!! I thought I made cookies a lot, but 5 times a week! Wow!! Keep the cookies recipes coming I love them! Oh I have serious issue Jen! Thanks for the comment, I will definitely keep those cookie recipes coming.